Soundings 3.3 closes the third season of a concert series where the Del Sol Quartet explores a single work from a contemporary composer, paired with new artworks from local visual artists. Each concert includes performance and discussion with the audience, musicians, and commissioned artist in an informal and intimate venue, followed by a post-concert reception. This concert features Jack Body’s “Epicycle” (1989, rev 2004), in memory of the composer who passed away in August of 2015, paired with Matt Gilbert, a young artist currently completing his MFA degree at University of California at Davis. With a background in graphic design, an affinity for contemporary music and an interest in experimenting with materials, Gilbert makes tiny, motorized kinetic sculptures. With its series of rapidly played, interlocking musical phrases passed from player to player, much of “Epicycle” is the ultimate, kinetic “hocketing” experience. Body’s piece also reflects his interest in Asian music and culture, as in the second section of “Epicycle,” which explores different styles of vibrato from Korean traditional music. Del Sol premiered this version of Body’s piece on their 2006 Home Season series and recorded it on their “Ring of Fire” CD (2008). The group was saddened to learn of Jack Body’s death on May 10, 2015 and immediately decided to bring “Epicycle” back into their active repertoire as a tribute to this marvelous composer. New Zealander Jack Body (1944-2015, NZ), had a maverick career as a composer, ethnomusicologist, concert producer, music publisher, teacher and proponent of his country’s music and the music and culture of Asia, especially Indonesia. He also worked in experimental photography and computer-controlled soundimage installations. He studied at Auckland University, in Cologne and at the Institute of Sonology, Utrecht, and taught at Victoria University of Wellington, NZ for 30 years. There he established a residency for traditional musicians to work with composition staff and students. Body traveled widely in the Asia-Pacific region, was involved in the Asian Composers League, directed major international music festivals and was a featured composer at the 9th Other Minds Festival in San Francisco in 2003. He composed solo and chamber works, music for orchestra, music-theater, opera, dance and film, as well as electroacoustic compositions using field recordings from Indonesia. Recipient of Del Sol Performing Arts Organization Zellerbach Community Arts: July 2015 Attachment 4 Page 2 of 2 many international awards, shortly before his death in 2015 he received the New Zealand Icon Award from the Arts Foundation of New Zealand, becoming the first composer to be so honored. “Epicycle” will be paired with Matt Gilbert, a young local artist with a background in graphic design and an interest in contemporary music, makes tiny kinetic sculptures. His artworks–moving mechanisms composed with a 3-D printer, a makeshift mini-machine shop, surplus store items, handmade circuit boards and dark dental floss–demonstrate his “playful engagement with the scientific imagination.” Gilbert has been making art and tinkering with electronics since childhood when he attended the South Carolina Governor’s School for the Arts and Humanities. After graduating from the Art Center College of Design in Pasadena, CA, he worked in graphic design in Atlanta and started making his own musical instruments and sculptures mimicking the movement of insects. He is currently completing his MFA in Studio Art at University of California at Davis. In 2014 he received a Magrit Mondavi Summer Fellowship, which enabled him to spent time at contemporary art and music centers in France, where he also visited prehistoric cave paintings. 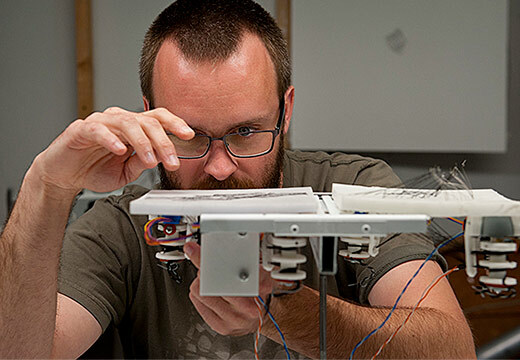 In a subsequent workshop at Stanford’s Center for Computer Research in Music and Acoustics, he developed a filter to reproduce the cave’s acoustical qualities, which he later used in a collaborative project with a composition student.